Handmade leather belts. Made in the UK with English bridle leather. 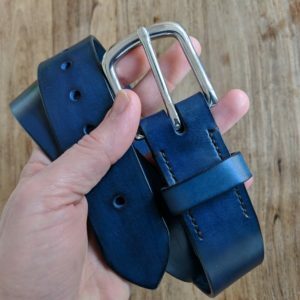 If you’ve been looking for a handmade leather belt, then look no further! 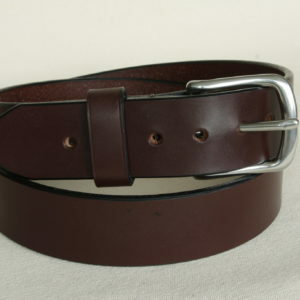 With their classic style and rugged construction, these leather belts would make a great gift to you or somebody else. With their hand-stitched belt loop and stainless steel or brass buckle these exceptional quality handmade leather belts will last a lifetime. These belts are 4mm thick and would be great to wear with jeans or chinos. 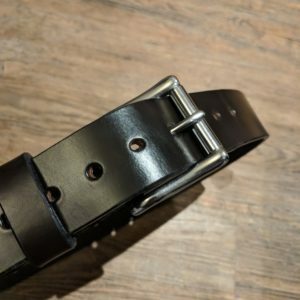 Made from English bridle leather and using buckles sourced from UK based suppliers these belts are individually made to your exact specification. The belts are finished with a leather polish and the edges are hand burnished with a special sealant and good old elbow grease. If you can’t find a combination of width, colour, buckle and stitching that you like, please contact me and we can work together on your requirements.